The Quilt Rambler: Still working! Progress is slow going sometimes, but anything worth doing is worth doing right! That said, I've been glued to my laptop for over 15 hours today (with a nice outdoors lunch break) uploading data, resizing images, editing my thousand and one typos (grin) all in an effort to regain my presence on the world wide web - and hopefully before the Dallas Quilt Celebration next weekend! 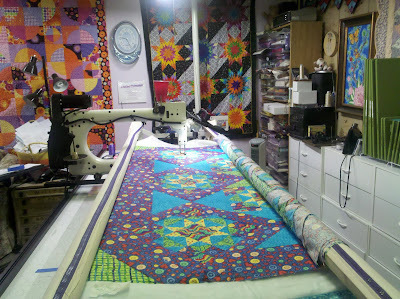 I'm eager to share with quilters the beauty of being an A1 Quilter! If you are in the area, stop by booths 154-155 for a proper Texas howdy and a hug to boot! and through email to get the background design of my new website "just right" - now it's up to me to fill up the spaces. Not an easy task for this chatty lady! I've got so much to share!! enjoying learning a new content management system. It hasn't been painful at all, I guess because I'd created and managed my last website...oh but this one is sooooo much better! I'm no longer limited to someone's template, I'm able to add design/layout elements to my little heart's content! Pages and pages, images upon images...and with this new host I'm not limited to a certain number of pages! I can even have PDF files for my viewers to download! How exciting! ....hum...somehow I've got to factor in time to do the binding on three lap quilts before Dallas...oh my...no rest for my wrists that's for sure! I just love my job ....er....this passion called quilting! Website UP and we're in DALLAS!